I bake. A lot. I am not a professional baker. I suspect if I were, the whole process would become a bit tiresome and I'd do something else. I'm a Hobby Baker. I also approach the process of Baking from the aspect of my training in Programming and Computing. That is to say, If I Do This, Then The Results Are That. If, Then, Else. Typical Programming Structure. I realized lately I was not happy with my results. My Else was flawed. My breads were better than what you'd find shrink wrapped in a supermarket, but not really enough to make it worth the effort of baking and then cleaning the flour out of my kitchen floor grout. Coming from Philadelphia, Bread can easily become an Obsession. The water there is excellent for baking, which is something you will hear about every town that draws from the Delaware Watershed, including the big monster 90 miles Northeast of Philly that is famous for their Bagels - for good reason. You can get a hoagie or a cheese steak anywhere in the country these days, but unless they're served on a proper Amoroso Roll, it's going to taste like mush. Being disappointed with my Only Slightly Better Than Mass Market results, I slacked. I used some "lesser" flour like the All Purpose or Bread Flour with the store brand sticker on it. Not all that good. The water here in Florida is great for swimming in and fishing but for baking bread it is horrendous. Filter the water at the very least so it no longer smells like it had been drained from the Fort Lauderdale High School swimming pool and isn't tan from the tap. Oh, yes, really. The water has a tan tint to it and smells of chlorine. Especially this month when Fort Lauderdale is flushing their lines with Chlorinated water. So I stepped away and was getting some rather excellent Ciabatta Rolls from GFS Marketplace and let the bread machine go idle. The exception was my Pizzas. 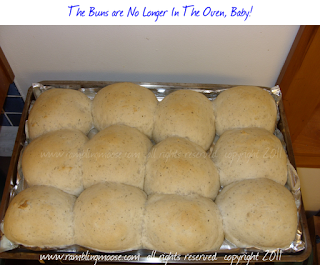 I was making the dough in the bread machine, rolling it out and allowing it to rise for sometimes as long as 2 hours and not quite getting what I expected, but it was always better than the best local restaurants. Still worth my while enough to make me look at what I was doing wrong. This weekend we wanted a Pizza. I buy Mozzarella Cheese when it is on sale, add Feta and Fresh Parmesan to it and layer that over top of a Pizza Sauce that is store bought but not bad. It is an easy meal, better for you than at a Pizza restaurant because I use better ingredients, and takes only an hour or so to fully prepare. The problem was that the crust wasn't "quite right". I was thinking about that and how I am using exactly the same recipe I used in Philly while walking through the flour aisle at GFS when I spotted something that woke me up. If you're a bread baker, you know each flour has its own personality and will give its own texture and taste to the dough. High Gluten Bread Flour specifically has extra protein and the texture will be more stretchy. That stretchiness allows the dough to rise higher and has a stronger taste than the All Purpose flour you have around and generally don't give much thought to. All of that was my lightbulb moment. It was also my "Duh!" moment. I realized I had slacked and cut corners and it was time for me to go back to basics. I grabbed a 25 pound bag of flour and came home and made the best pizza I have had since I moved to Florida. The bottom of the crust was crispy which I had not had either. Since I am watching my calorie intake and getting excellent results, I had been using mass market hamburger buns for small sandwiches. 120 calories a piece and having practically no taste, it is what you'd expect when going to a fast food restaurant - something to keep the food away from your hands in a sandwich. I got to thinking that Pat's Pizza Dough Recipe that I have been using for more than 10 years now was a perfect loaf of bread to try this out. I got out the calculator and scientifically figured that if I use 78 Grams of Dough I could make a 120 calorie roll and probably get something better. No more "Bachelor Chow" burger buns, these had Flavor! Or so I would learn later. You see, the little "1/4 pound burger" buns were the control for the experiment. I was shooting for that but a little better. I got a LOT better. The results are in that picture. Those rolls were as tall as your longest finger. Just get the gram scale out, measure 2.1 ounces of dough exactly. Each ounce is 35 grams, two ounces is 70, but the extra 8 grams is a better size and used the dough evenly. I got an even dozen dough balls and walked away from the kitchen for two hours. The whole while, the house was being infused with the perfume of rising dough and my little Yeasty Beasties doing their best to make my later dinner perfect. In fact, it's easy to say that that particular combination of Filtered Water, High Gluten Bread Flour, and 2 hour rising time was the key to this lab experiment. The trick is cracking the recipe for your current conditions. Things change. You Move. You forget things, and sometimes it's time to go back to basics. Big Fluffy Buns that were dusted with a tablespoon of "Italian Seasoning" from McCormick in the Dough Stage turned out to be just the right touch for the evening burger that I found in the freezer. There is only one problem. I have leftover mass market burger buns that taste like nothing. No biggie, they'll get eaten, but each time they do, I'll realize that to bake well sometimes you just have to go back to the kitchen and play with your flours.